Satellite measurements have shown this area is losing ice and surrounding glaciers are thinning, raising the possibility the ice could flow quickly out to sea. To investigate this possibility, an international team of researchers funded by NASA and the National Science Foundation will travel to Pine Island Glacier next month. The multidisciplinary group of 13 scientists, led by Robert Bindschadler, emeritus glaciologist of NASA’s Goddard Space Flight Center in Greenbelt, Maryland, will depart from the McMurdo Station in Antarctica in mid-December. 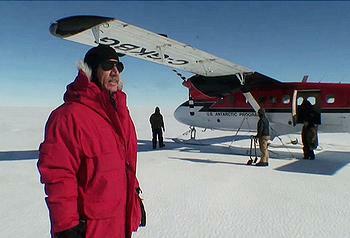 They plan to conduct research on the ice shelf for six weeks. During their stay, they will use a combination of traditional tools and new oceanographic instruments to measure the shape of the cavity underneath the ice shelf and determine how streams of warm ocean water enter it, move toward the bottom of the glacier and melt its underbelly. In January 2008, Bindschadler was the first person to visit the area as part of initial reconnaissance for the expedition. Scientists had doubted it was even possible to reach the crevasse-ridden ice shelf. Bindschadler used satellite imagery to identify an area where helicopters could land safely to transport scientists and instrumentation to and from the ice shelf. The team will use a hot water drill to make a hole through the ice shelf. After the drill hits the ocean, the scientists will send a camera down into the cavity to observe the underside of the ice shelf and analyze the seabed lying approximately 1,640 feet (500 meters) below the ice. Next, the team will lower into the hole an instrument package provided by oceanographer Tim Stanton of the Naval Postgraduate School in Monterey, California. The primary instrument, called a profiler, will move up and down a cable attached to the seabed, measuring temperature, salinity and currents from 10 feet (three meters) below the ice to just above the seabed. A second hole will support a similar instrument array fixed to a pole stuck to the underside of the ice shelf. This instrument will measure how ice and water exchange heat. The team also will insert a string of 16 temperature sensors in the lowermost ice to freeze inside and become part of the ice shelf. The sensors will measure how fast heat is transmitted upward through the ice when hot flushes of water enter the ocean cavity. Sridhar Anandakrishnan, a geophysicist with Pennsylvania State University, will study the shape of the ocean cavity and the properties of the bedrock under the Pine Island Glacier ice shelf. He will generate waves of energy by detonating small explosions and banging the ice with instruments resembling sledgehammers. Measurements will be taken in about three dozen places, using helicopters to move from one place to another. Scientists already have determined the interaction of winds, water and ice is driving ice loss from the floating glacier. Gusts of increasingly stronger westerly winds push cold surface waters away from the continent, allowing warmer waters that normally hover at depths below the continental shelf to rise. The upwelling warm waters spill over the border of the shelf and move along the sea floor, back to where the glacier rises from the bedrock and floats, causing it to melt. The warm salty waters and fresh glacier melt water combine to make a lighter mixture that rises along the underside of the ice shelf and moves back to the open ocean, melting more ice on its way. How much more ice melts is what the team wants to find out, so scientists can improve projections of how the glacier will melt and contribute to sea-level rise.